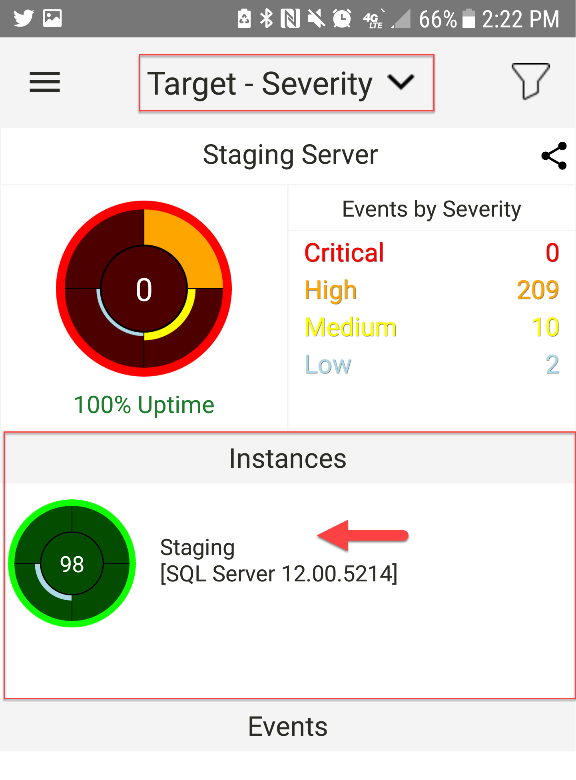 Note: SentryOne offers a mobile app for Android and iOS. 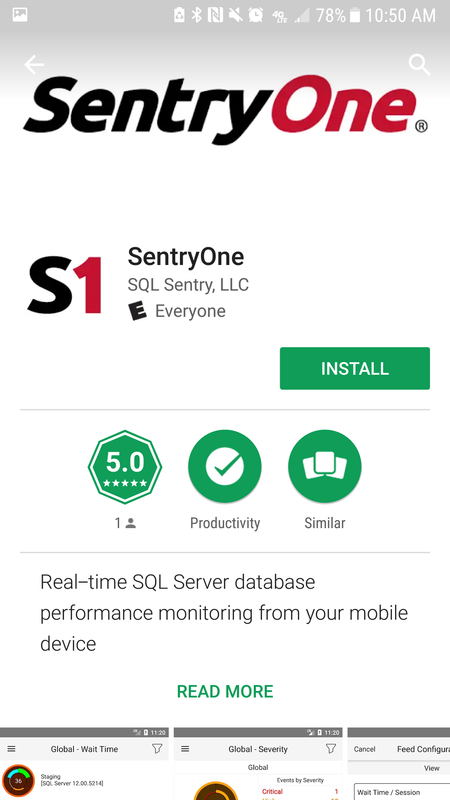 To access the SentryOne mobile app, you must first create an account with cloud.sentryone.com. A private web client isn't compatible with the mobile app. Once you've created an account on the cloud, download the app from the iOS app store or Google Play store, and then log in with your cloud credentials. 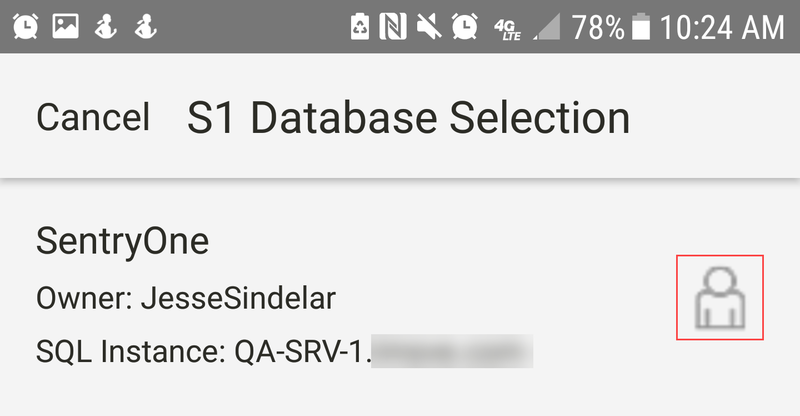 If you have more than one database, the S1 Database Selection screen appears. 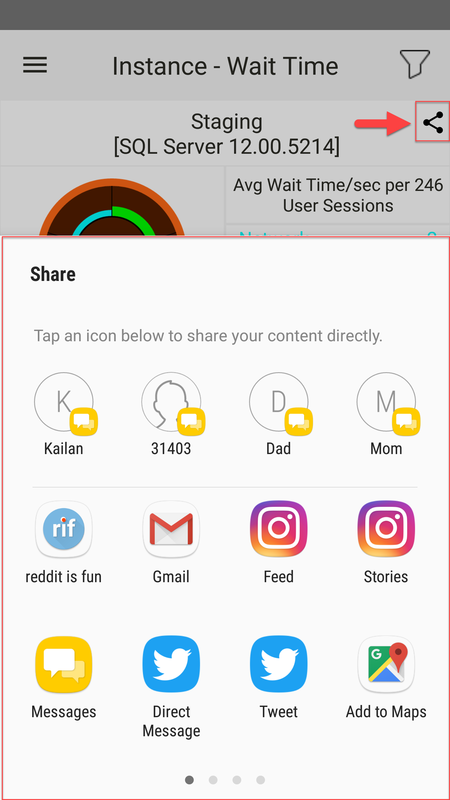 The icon on the far right changes depending on Shared versus Single databases. 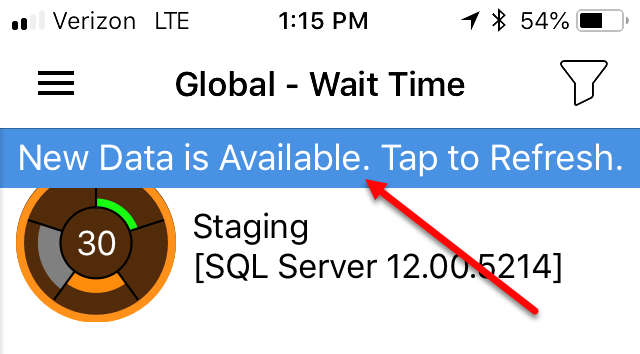 If you have one database, the Global Wait Time screen appears automatically. Global Wait Time, also called Query Engines, is the default view. The top half of the screen lists the watched targets or virtual machines, including the target type and version number. 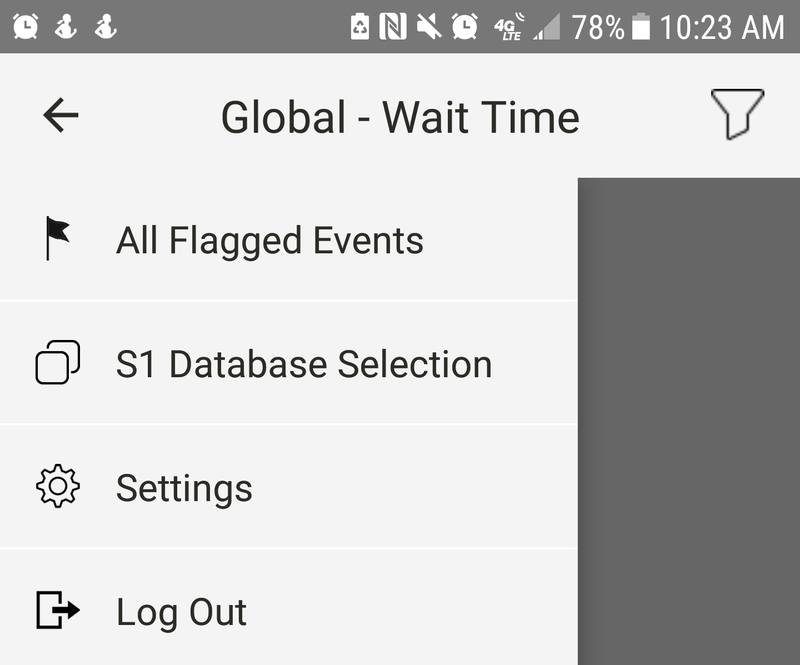 The wedget displays the Global Wait Time score. The wedget is divided into five sections. Going clockwise, these sections represent waits of different categories. As these waits increase, the corresponding section begins to fill, and the wedget begins to change color, going from green to yellow to red. 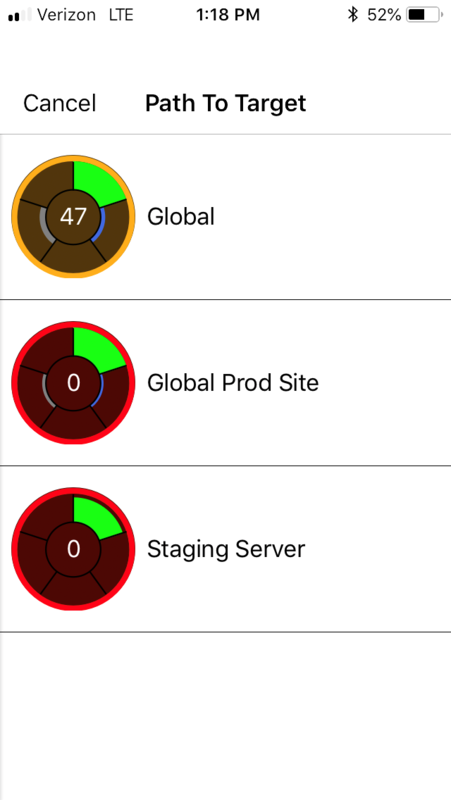 For more information about the Global Wait Time score, see the Cloud Server Health Status topic. 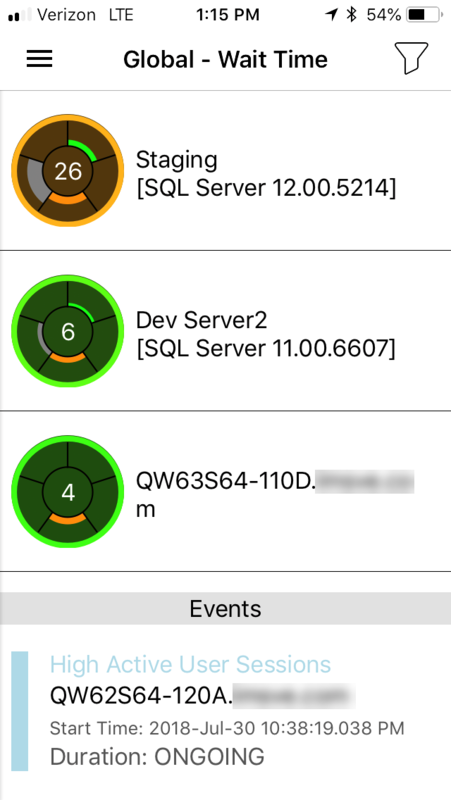 You have the option to monitor Events by Tag, Events by Severity, or Events by Wait Time. 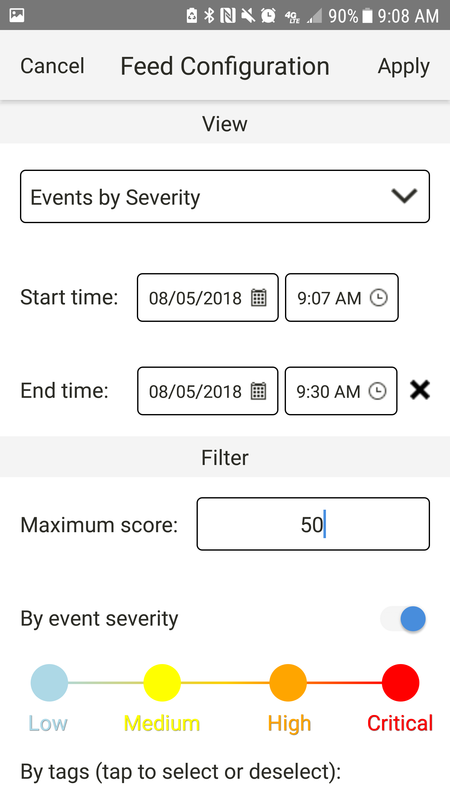 Events by Tag and Events by Severity work by incorporating Advisory Conditions to calculate scores. 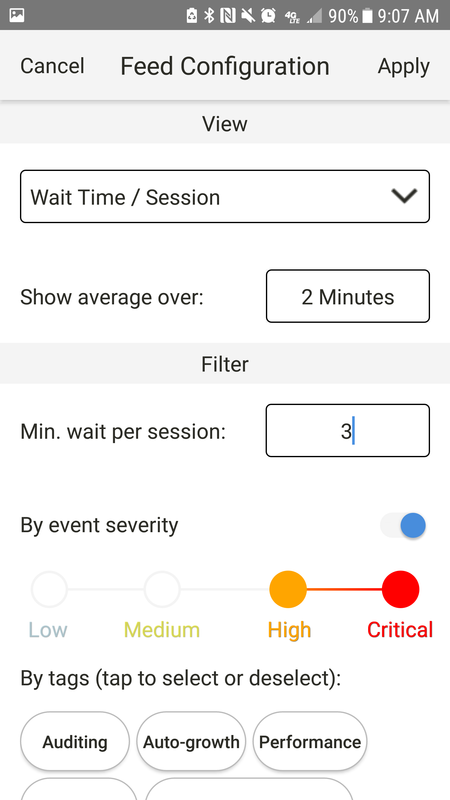 Events by Wait Time calculates scores by the number of current waits in your environment. For additional information about health scores and health indicators, see the Cloud Server Health Status topic. 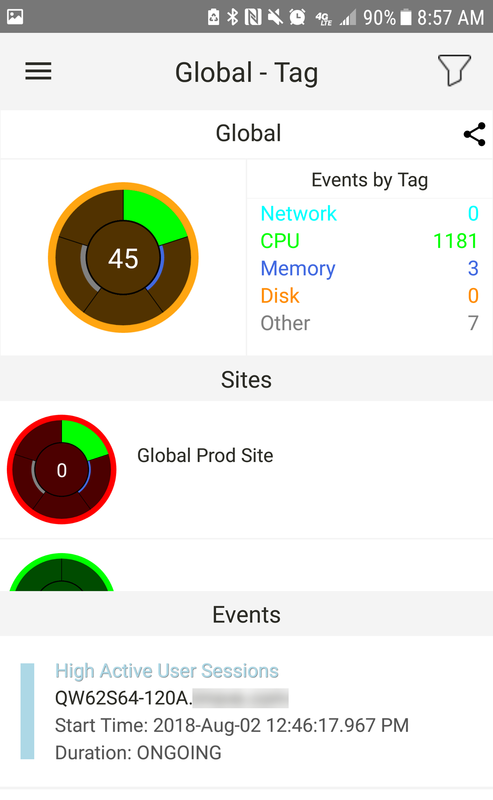 A list of event aggregates is at the bottom of the screen. 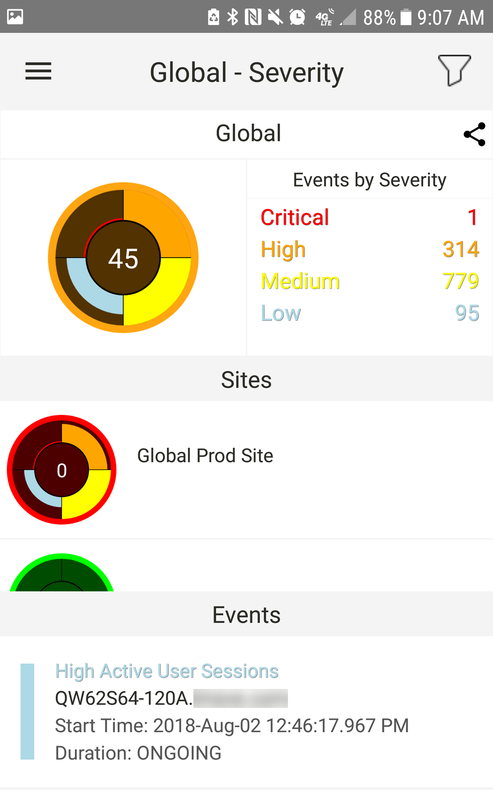 They are pulled directly from the server and are related to the Advisory Conditions set by the user in the SentryOne client. 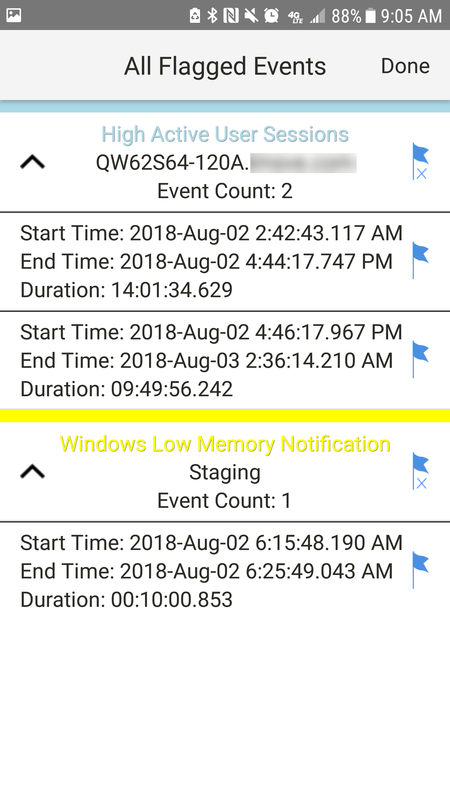 Select an event from the list to display details about that event. Flag an event for later by selecting the event and then selecting the Flag icon next to the event instance. 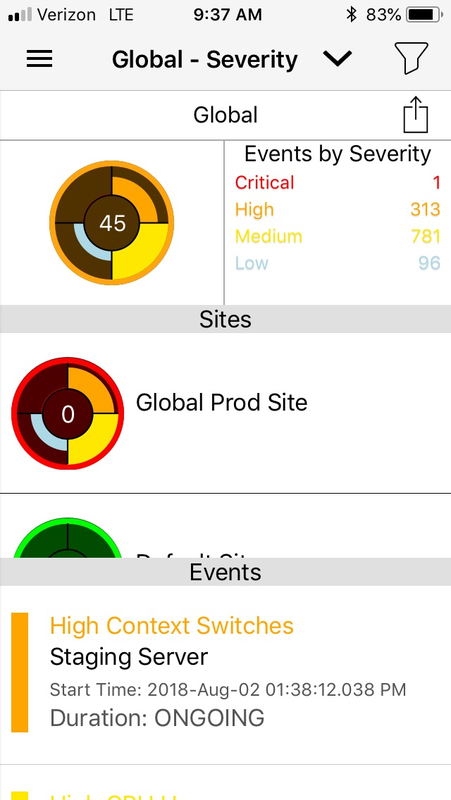 The Share button appears different in iOS and Android , but you have the option to select the Share button to take a screenshot of the server health score. 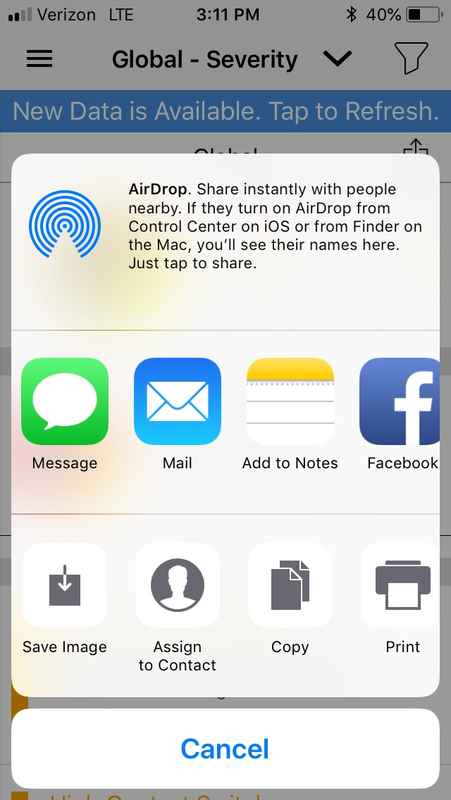 The screenshot can be sent by email or text message, or it can be shared on Facebook. You also have the option to save or copy the screenshot. New database data becomes available every 90 seconds. 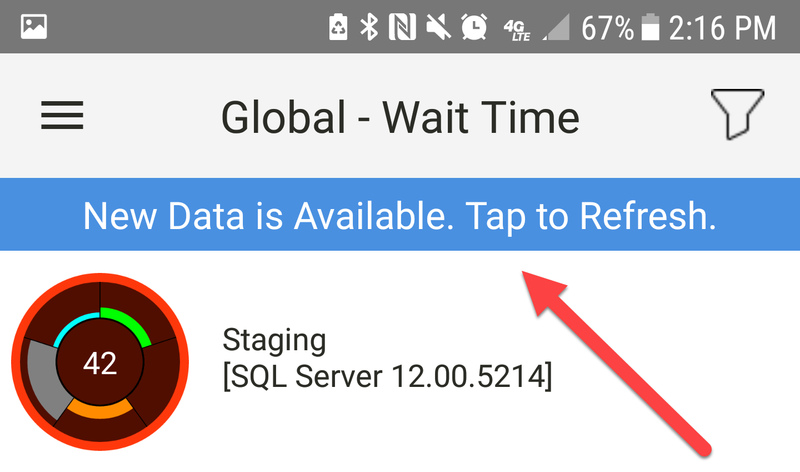 A blue notification banner appears at the top of the screen indicating that the app has synced from the cloud and new data is available. Select the blue banner to refresh the data. Return to any view by using the Path to Target function. Select the icon by the View level to open the Path to Target function, and then select the desired view to display. Select to open the Feed Configuration view. 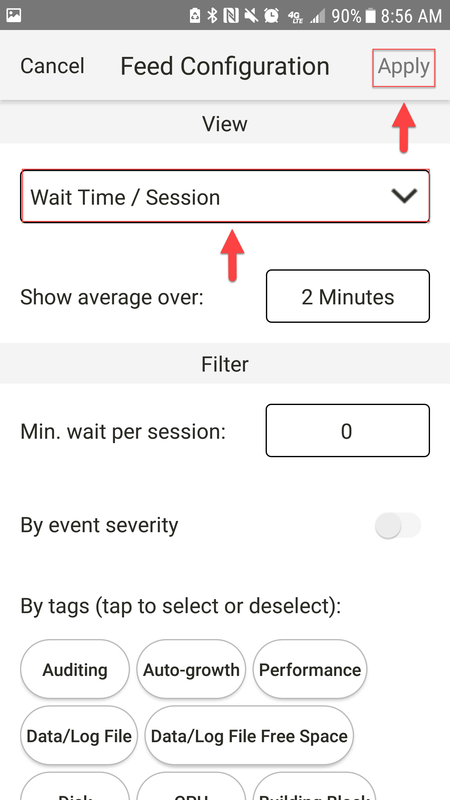 Select your desired view ( Wait Time/Session, Events by Severity, or Events by Tag) from the drop-down menu, and then select Apply to save your settings. 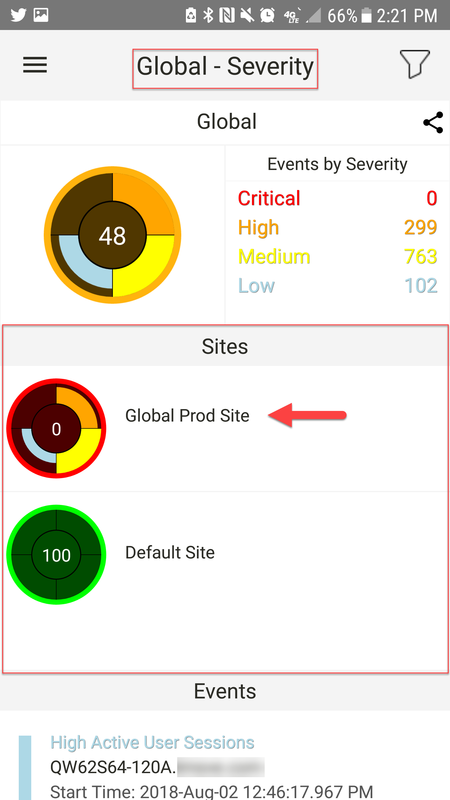 From the desired Global view, select a site to drill in to. This opens the Site view. Select a target to drill in to. This opens the Target view. 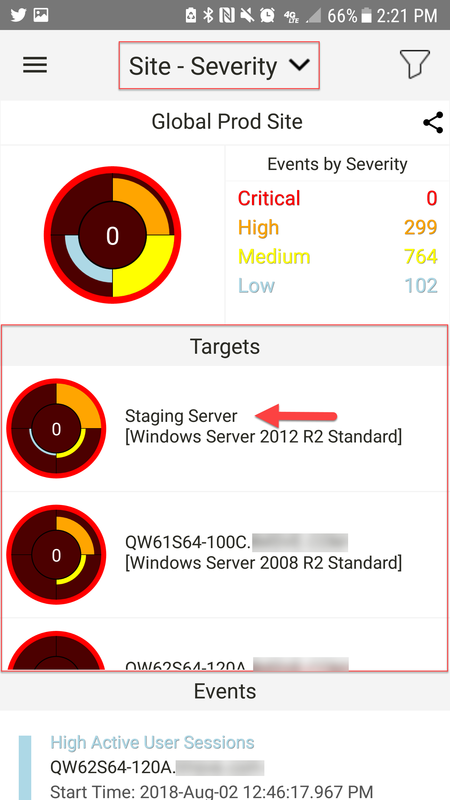 From the Target view, select an instance to drill in to. 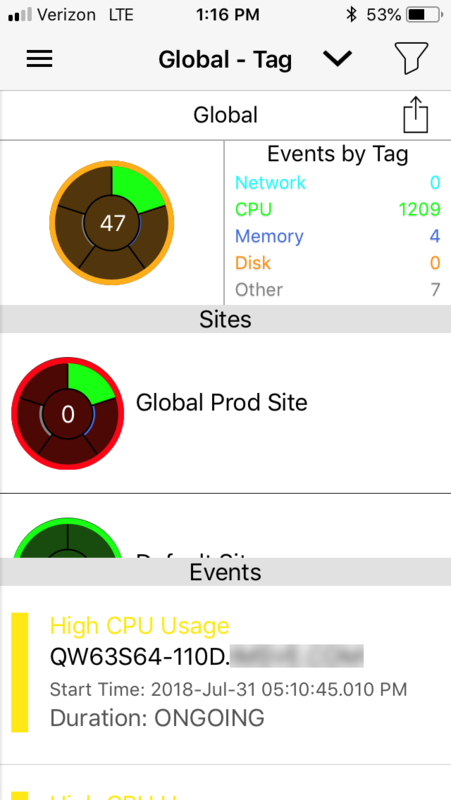 This opens the Instance view. 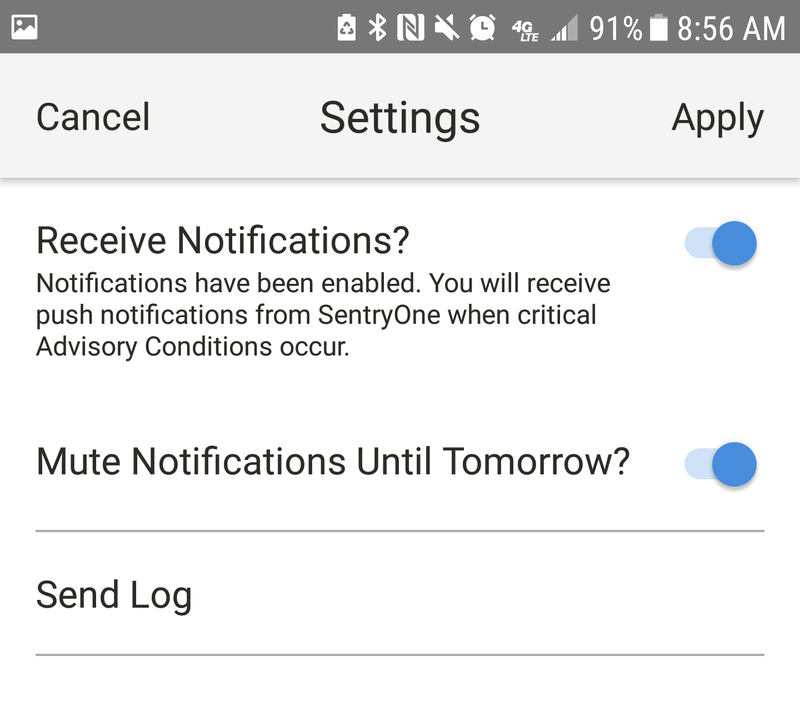 Note: Applying a custom filter in the SentryOne mobile app changes the color of the Filter icon. 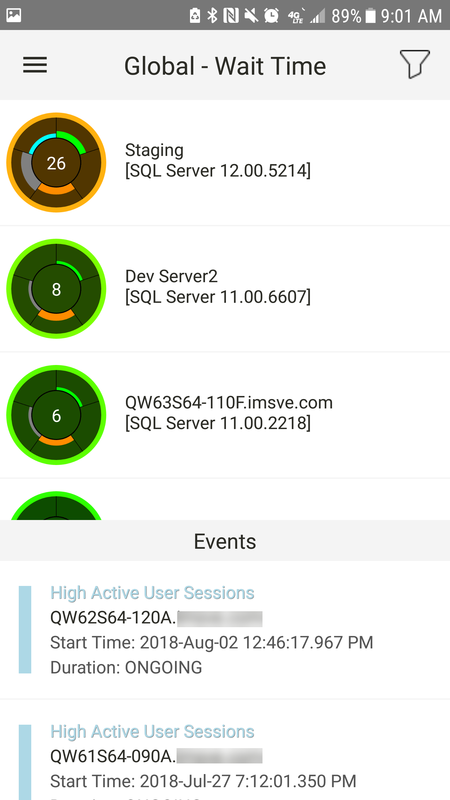 Select a time interval to show the average wait time/sec per user sessions. 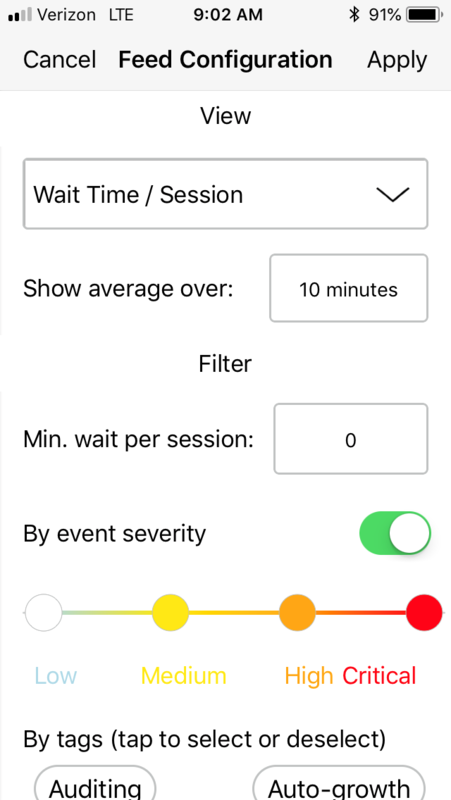 Filter events by selecting a minimum wait time. 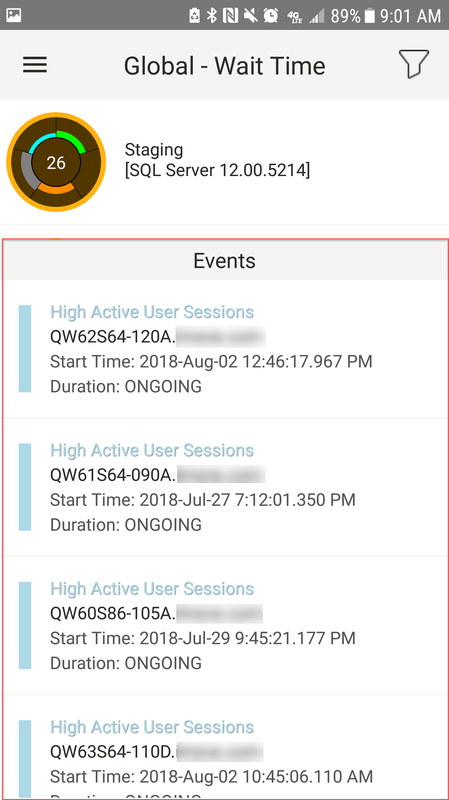 Events with a wait time less than the entered time are not displayed. By event severity Enable to focus on levels of severity by color coding. By tags Select/Deselect to filter by tags. 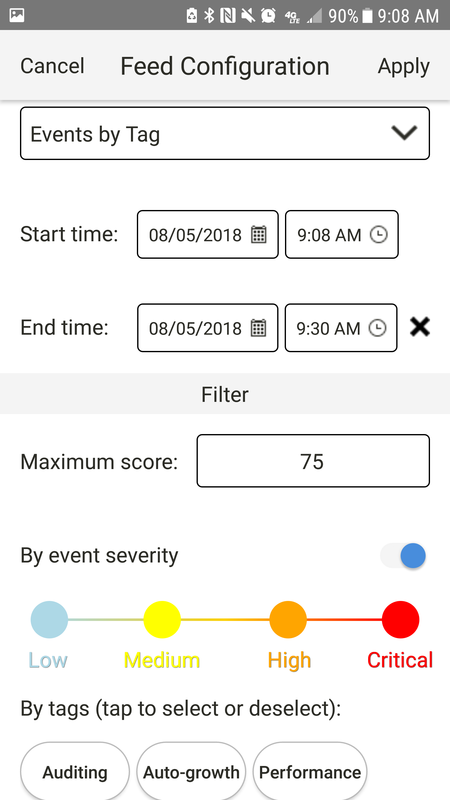 Start/ End time Filter events by a day and time range. 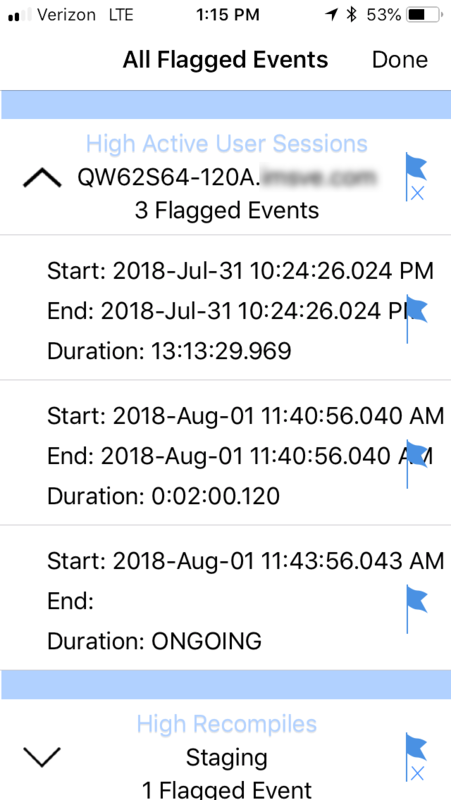 Enter a Start time and End time, and then select Apply to filter events by the desired time frame. 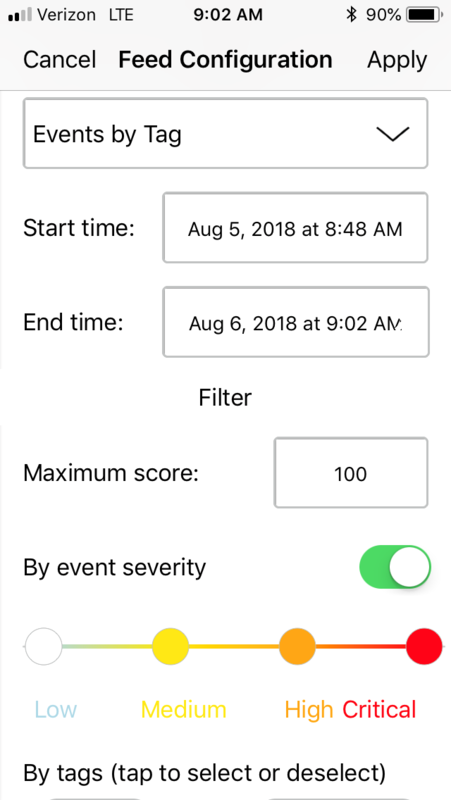 Maximum Score Filter events by score. Enter a maximum score to only display events that go below this threshold. 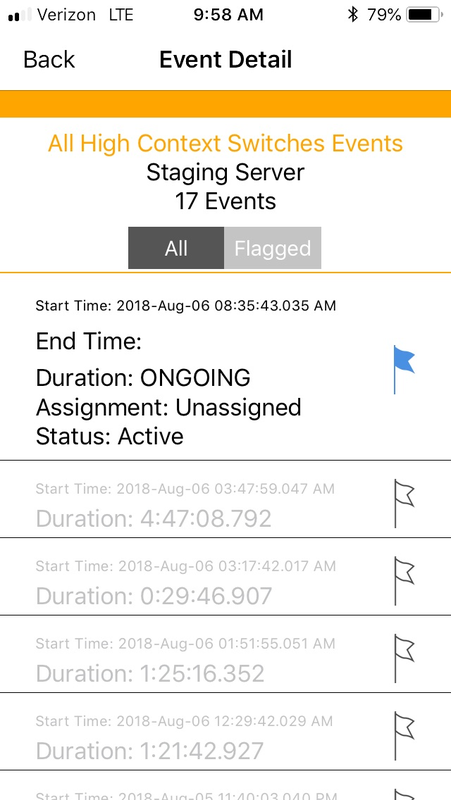 Start/End time Filter events by a day and time range. 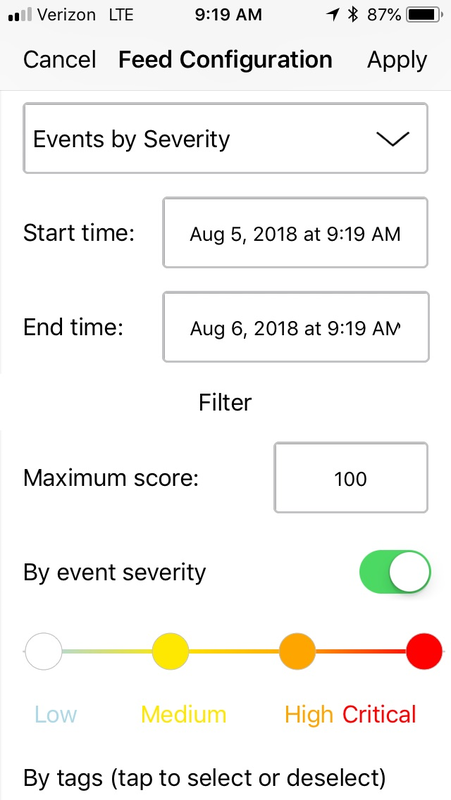 Enter a Start time and End time, and then select Apply to filter events by the desired time frame. 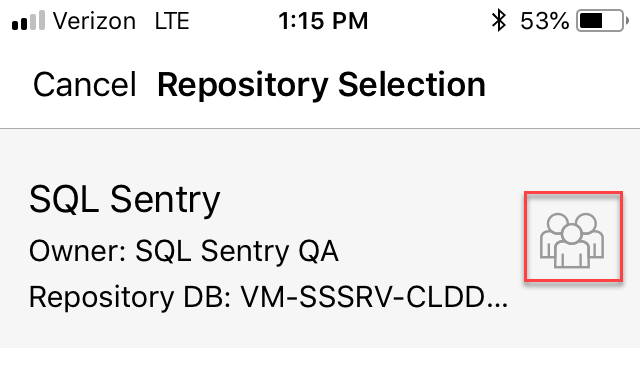 Navigate through the SentryOne App using the Selection menu. Open the Selection menu by selecting . 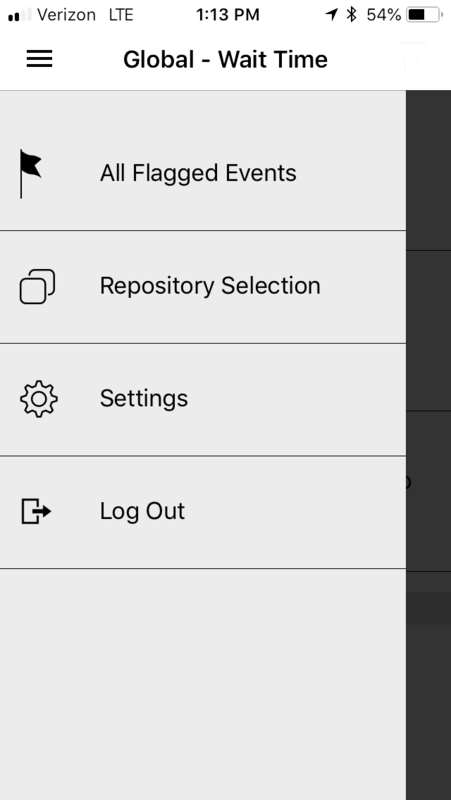 All Flagged Events Displays a list of the current flagged items. There is the option to remove all flagged events from a list of flagged events. 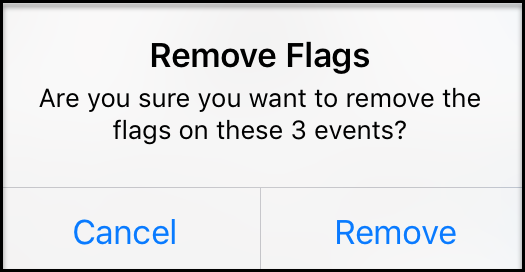 Select the Flag icon and a message appears, and then select OK to clear all the flagged events. S1 Database Selection Displays a list of the available databases that are being monitored. 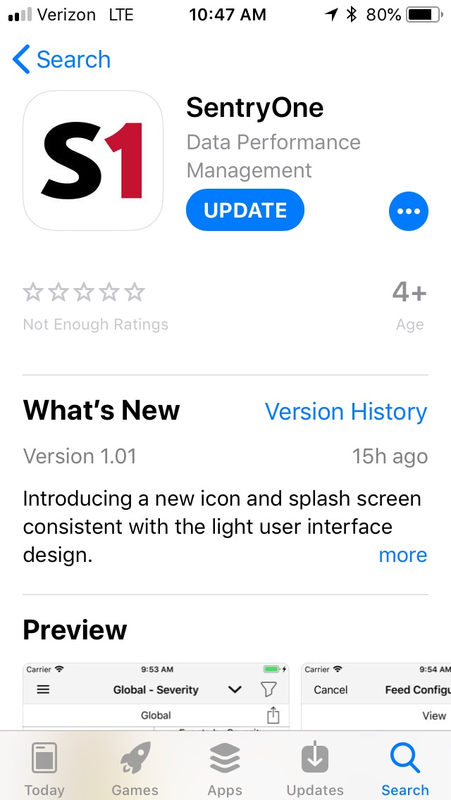 Settings Allows you to register for notifications. 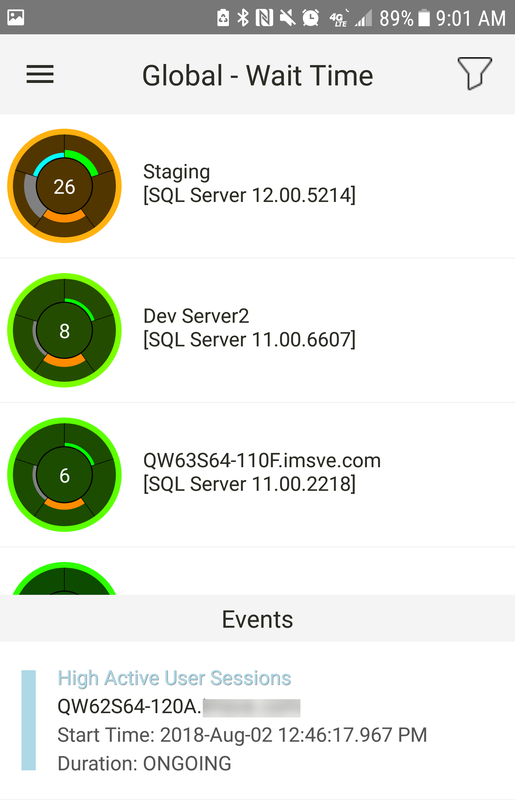 You can also send a log to mobile support if there are any issues with the app. 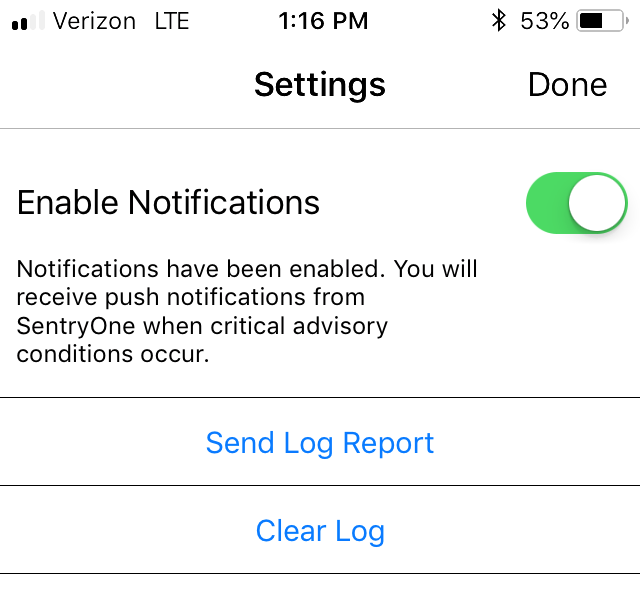 Note: IOS has an option to Clear Log if you decide not to send a log to mobile support. Note: Android has an option to Mute Notifications Until Tomorrow. Select this option to snooze notifications for a day, and then select Apply to save your settings. Log Out Logs you out of the app.